One of our finest collections comes from Laderach of Switzerland. 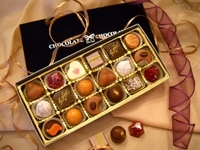 In the charmed Canton of Glarus, at the foot of the Glarner Alps, and tucked away from the madness of the present day world, old world artisans create exquisite bon bons that will delight your mood and palate. PLEASE NOTE: Custom packaged in our Chocolate Chocolate black velour box. Assortment may include, but is not limited to the following pieces: 80% Le Noir, Dark Moon Rising, Raspberry Pleasure, Devilish Box, Royal Crunch, Trio of Hazelnuts, Coco Bella, Champagne Truffle, Pistachio Prize, Orange Splash, Creamy Dreamy (hazelnut cream) Personalized Chocolate Chocolate Ganache, among others. Note: Pieces vary from pictured.